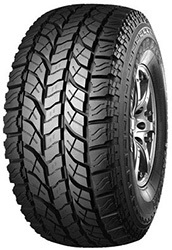 Probably the most popular tyre in the SUV/4x4 Class from Yokohama, the Geolanda A/T-S is produced in a massive range of sizes and is a superb all round 4x4 / SUV tyre. The Geolandar A/T-S provides excellent traction both on and off road and provides exceptional levels of wet level braking perfomance, scoring B or above in most sizes that the tyre is produced in. The anti uneven technology that is found in the Parada range is also applied here, helping to prevent uneven wear of the tyre and thus giving you more miles from you tyre. Used by many manufacturers as original equipment, including on the highly regarded Mercedes Benz G class.